In the mood for something creamy, yet savory? Try out our simple frittata recipe that is a huge hit with the kids at lunch! Feel free to add in some ham + cheese, or spinach to spice it up. Combine ingredients, blend with an immersion blender. Place blended ingredients into ramekins (if you don’t have ramekins, use an oven pan that is deep so the egg mixture won’t spill, and keep the height of the mixture to no more than 3 inches), and bake at 300F until set and golden brown. Caramelizing brussels sprouts is pretty fun! Have you ever tried it? If you haven’t ventured that way yet you should with a little inspiration from us, and our seasonal table top that our kids get to read while eating lunch at school. Steam sprouts in boiling water for 4 minutes, or until bright green. Place steamed sprouts on cutting board, cut in 1/2. Over medium heat, heat up olive oil in a pan, then add your halved sprouts, flat sides facing down. Sprinkle a pinch of sea salt. Let cook for 4 minutes. 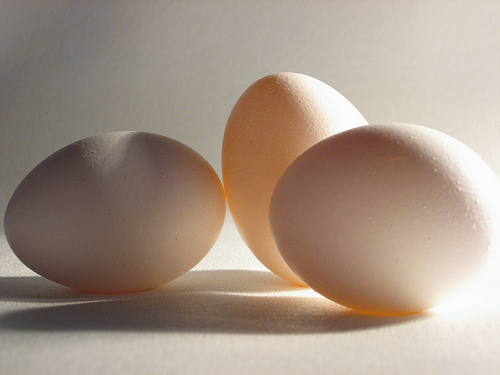 Check for doneness by flipping one or two over to see if they have browned. Once all browned, flip them on the other side for 4 minutes. Remove from the pan, and enjoy! Cut sprouts into thin slices. Over medium heat, heat up olive oil, then add your sprouts. Sprinkle with sea salt. Let cook for 4 minutes. Flip them over, cook for another 4 minutes and voila, perfectly caramelized brussels sprouts in no time! I got a little experimental one day, as my fridge didn’t contain many obvious lunch options. 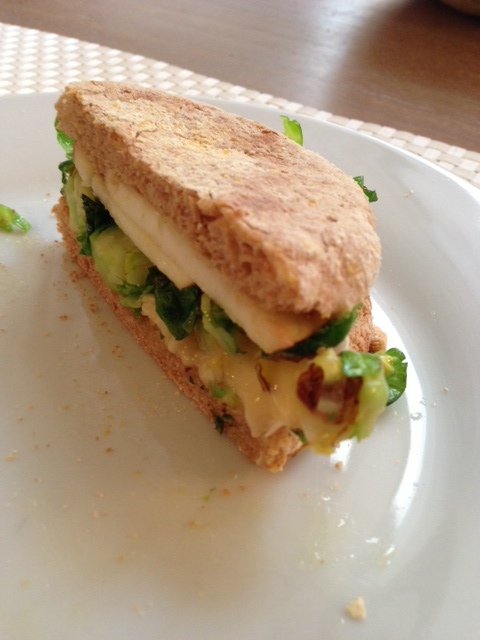 Up for the challenge, I spotted some brie, a spelt english muffin, some brussels sprouts, an apple and mustard, and made a surprisingly delectable lunch! Toast up an english muffin, or whichever bread you prefer and have on hand. Cut up the brie, and few thin slices of your apple. 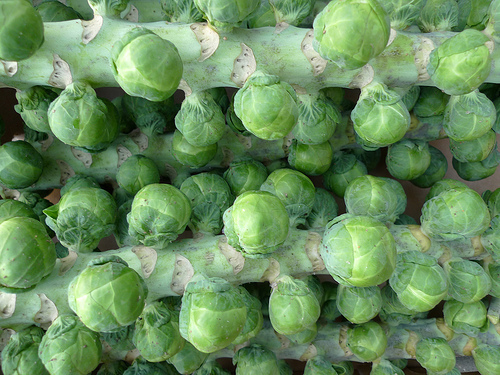 While your bread is toasting, thinly cut your brussels. In a small pan add olive oil, then in goes your brussels with a sprinkle of salt. Cook them over medium heat for 5 minutes, stirring, until slightly caramelized and fragrant. Assemble brie on the bottom piece of your bread, then spread mustard on the top piece. Top your brie off with the caramelized brussels sprouts, add apple slices, then place the mustard side on top of your goodies. Press down once, cut in half and savor all of those sweet, tangy and creamy flavors that come from this satisfying seasonal sandwich (and happy accident!). 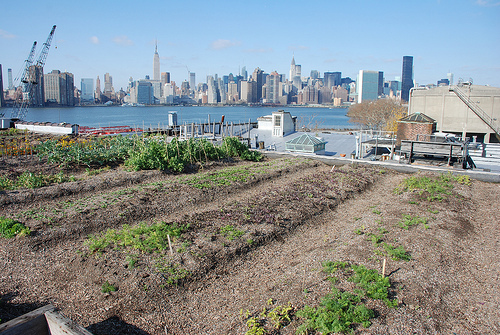 All over New York City, farms and gardens are sprouting up on public school roofs, backyard lots and even in their front yards! Educators and lawmakers alike are beginning to put into practice what many supporters of an edible education have been advocating for years: giving kids an opportunity to plant, grow and harvest during the school day. In a city where most blocks are lined with a few trees or the occasional flowerbed, schoolyard gardens provide urban students firsthand contact with nature, teaching them how food grows. By getting their hands dirty, they cultivate a more evolved knowledge of what constitutes healthy, natural eating, stressing the importance of fresh produce and the lifecycle of food. The importance of garden-based learning can also be viewed as a potential interactive solution to the ongoing obesity challenge that our country faces. According to GreenThumb, the number of school-based gardens increased exponentially in the span of two years, from 40 to over 230! GreenThumb has been an excellent source for these initiatives, providing community gardens throughout the city with programming and technical support. On Avenue B and 5th Street in the East Village, a brand new 2,400-square-foot garden opened at the beginning of the school year. Sitting atop a red-brick building that is home to three separate public schools, the Earth School, Public School 64 and Tompkins Square Middle School, this giant rooftop educational farm was designed by Michael Arad. Arad, also the architect behind the National September 11 Memorial further downtown, was inspired to create the Fifth Street Farm after learning that his own children (former students of the school) were in awe that their crisp and juicy apples once were plucked from trees. The Horticultural Society of New York has been working with over two dozen schools since 1980, helping them with the design, construction, and education curriculum. The Hort’s mission “is to sustain the vital connection between people and plants” as they help out with the Earth School as well as more recently with four public schools in Queens. At P.S. 41 in Greenwich Village, the school’s newly opened 15,000-square foot garden is more than a source of fresh produce for lunch, but has really become an outdoor classroom. By teaching kids about art, science, and math through the lens of gardening, their school-day routine becomes more of a hands-on experience. This summer, for our third year, Butter Beans will be holding our Food & Garden Camp. With a similar mindset as these schools, our goal is to give your children a unique farm-to-table experience. From July to August, we will be covering the gamut of the food cycle from sprouting seeds and harvesting fresh food from rooftop gardens, to writing our very own cookbooks. Visit our website for more information. For another great examples of greening schools, check out this edible schoolyard in East London, where lots of growing is taking place each day (check out their “lessons in loaf” pictures, they are wonderful! ), and get to know Leave It Better, an organization that is accomplishing great feats in greening our local school communities as well.